Currently in the general jewelry consumer market, gold jewelry and diamonds are undoubtedly the most frequently purchased jewelry products for consumers. For the purchase of these two products, I believe that many consumers are also experienced. But apart from some common sense, what needs to be paid special attention? Gold jewelry 12 grams or less may be "unworthy of its name"
Purity is of course the most important consideration when buying gold jewelry, but do you know that the purity of gold jewelry may not be as marked when purchasing small gold jewelry of 12 grams or less. According to Wang Naizhu, gold jewelry requires welding processes to create a variety of shapes. Therefore, the presence of solder joints in some jewelry items is a must and normal, but these solder joint components are not pure gold. According to national standards, the purity of the solder joint part does not need to be marked in the stamp or label. â€œFor large gold ornaments, the weight of these solder joints is negligible in the overall weight, which does not affect the purity of large gold jewelry, but for small pieces of gold jewelry, especially 12 grams or less In more complex gold ornaments, the weight of the solder joints may account for a certain percentage of the total weight, so that the purity of gold ornaments will be reduced." Wang Naizhu reminded us that although this â€œunworthy of a nameâ€ is not a business intention to bully, but consumers should pay attention to this issue when buying small pieces of gold jewelry. Diamond Hearts, Arrows, and Cuts cannot be equated with standard cuts. 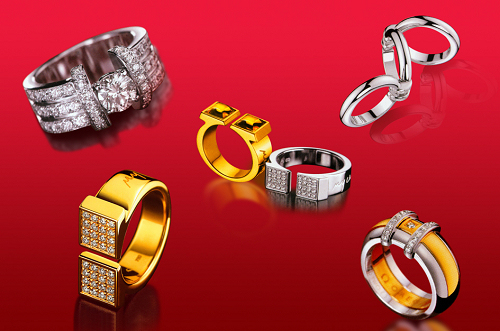 In recent years, diamond cuts have received more and more attention from consumers. The most popular is the diamonds with the "eight hearts and eight arrows" cut, but you Do you know that Hearts, Hearts, and Arrows cuts cannot be equated with standard cuts. Wang Naizhu said that consumers usually look at the degree of clarity, color, and cut in buying diamonds. But in fact, the clarity of the diamond does not need to be too demanding. "Because apart from the testing experts, no one would take a 20x magnifying glass to see if there is any flaw in the diamond on your ring. On the contrary, to make people in two meters You can see the shiny diamonds on your hands, depending on the color and the cut. The cut is particularly important." With the popularity of television shopping, diamonds cut in recent years with the "eight hearts and eight arrows" are very popular, but in the national and international cut standards, there is no "eight hearts and eight arrows" level.